Two Joint Committees have been set up, based around the two new council areas. Every Council in Dorset is represented on the Joint Committees, which will take all the key decisions needed locally to create the new councils. Joint Committee meetings are held in public, and minutes and agendas are published online at the Bournemouth, Christchurch and Poole Joint Committee website, and the Dorset Area Joint Committee website. 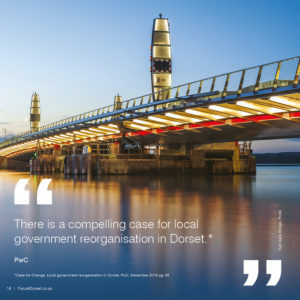 The Leaders of Dorset County, Bournemouth, North Dorset, Poole, West Dorset and Weymouth & Portland Councils have reconfirmed their commitment to plans to modernise local government in Dorset, protecting frontline services and boosting the area. No announcement is due from the Government now due until after 8th June. With Parliamentary recess for the summer taking place from 20th July to 5th September, it is possible there will be no announcement until the autumn. However, we continue to plan for an April 2019 go-live date for both new councils. The timing of the Government’s announcement on Future Dorset is likely to be impacted by the General Election proposed for June 8th. The period known as ‘purdah’, which restricts policy announcements before an election, commences on 8th May. We already know that there will be no announcement before 4th May, due to purdah for the Mayoral Elections, which are taking place across Britain. Central Government ‘purdah’ for Mayoral elections (which take place on 4th May in some areas of the country) gets underway tomorrow – Good Friday. We therefore do not expect a Government announcement during this period. 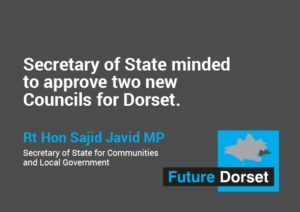 Last week, the Secretary of State for Communities and Local Government, Sajid Javid, visited Dorset to promote the local government elections, taking place on 4th May for the county council. His visit attracted some local media coverage. Mr Javid confirmed to us and to local news reporters that he “continues to consider the proposal” put forward by our six councils but “no decision has yet been made”. The go-live date for the new authorities remains April 2019, with full local elections in May 2019. In the meantime, keep up to date with all the news and views from #FutureDorset on Twitter @FutureDorset. The government has significantly reduced the funding it gives to local authorities to provide services. 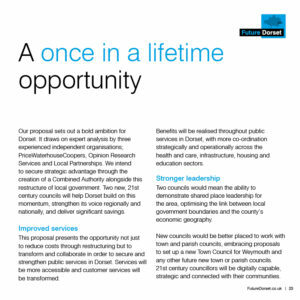 In response there is a proposal to create two unitary councils for Dorset; one for the urban area and another for the rest of Dorset. Councils need to be the right size to be sustainable and more aligned to the way people live their lives and their sense of place. https://futuredorset.co.uk/wp-content/uploads/2017/02/Future_dorset.png 0 0 Melanie Brown https://futuredorset.co.uk/wp-content/uploads/2017/02/Future_dorset.png Melanie Brown2017-03-28 11:45:132018-08-08 11:33:48Why is it time to make changes? 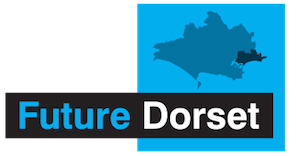 What are people saying about Future Dorset? This excerpt is page 10 from the proposal brochure. You can read the full proposal online. Scroll to the bottom of the linked page to see the document in a browseable reader.